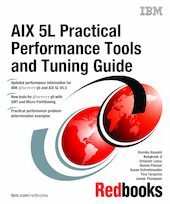 This IBM Redbooks publication incorporates the latest AIX 5L performance and tuning tools. It is a comprehensive guide about the performance monitoring and tuning tools that are provided with AIX 5L Version 5.3, and it is the ultimate guide for system administrators and support professionals who want to efficiently use the AIX performance monitoring and tuning tools and understand how to interpret the statistics. The usage of each tool is explained along with the measurements it takes and the statistics it produces. This book contains a large number of usage and output examples for each of the tools, pointing out the relevant statistics to look for when analyzing an AIX system's performance from a practical point of view. It also explains the performance API available with AIX 5L and gives examples about how to create your own performance tools. This book also contains an overview of the graphical AIX performance tools available with AIX 5L and the AIX Performance Toolbox Version 3.0. This book is a rework of the very popular book AIX 5L Performance Tools Handbook, SG24-6039, published in 2003.